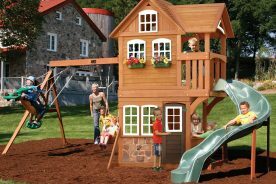 The Gorilla Playsets Catalina cedar wooden swing set is packed with nearly every feature you might find in any swing set. 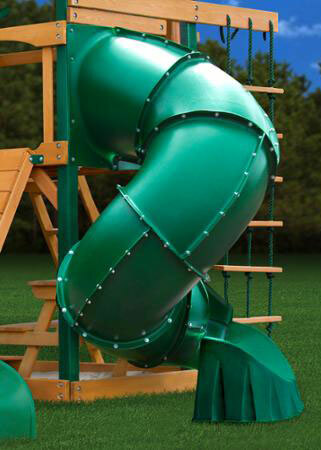 Your kids and all your neighbor’s kids are going to need a ton of energy to run all over this thing. 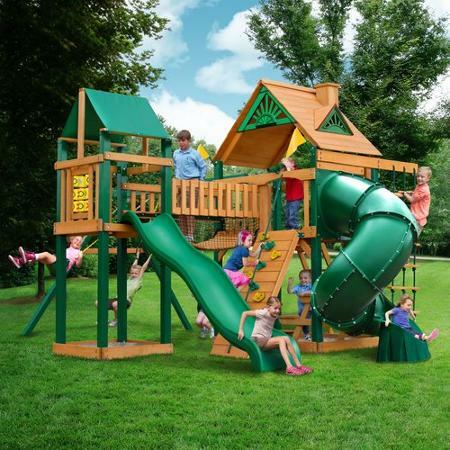 1 What is included with the Gorilla Playsets Catalina Cedar Wooden Swing Set? 2 How big is the Catalina? 3 Can I put the Catalina Swing Set together myself? 4 Is a copy of the instruction manual included? 5 What do I need to do to keep the swing set like new? 6 Is the Catalina Cedar Wooden Swing Set for me? 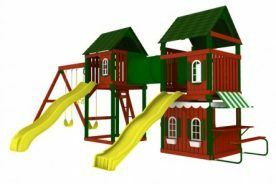 What is included with the Gorilla Playsets Catalina Cedar Wooden Swing Set? The Catalina has so many things to do, we can’t imagine your children ever getting bored with this swing set. The swing set is great for kids between the ages of three to eleven. Most swing sets you’ll find only have one clubhouse, but with this swing set you get two! The Catalina has a main clubhouse with a 4’x6’ deck covered by a wooden roof. A telescope and steering wheel are attached to the main deck. That would be a great place to play pirates. A secondary clubhouse has a smaller 3’x3’ deck covered by a vinyl roof. 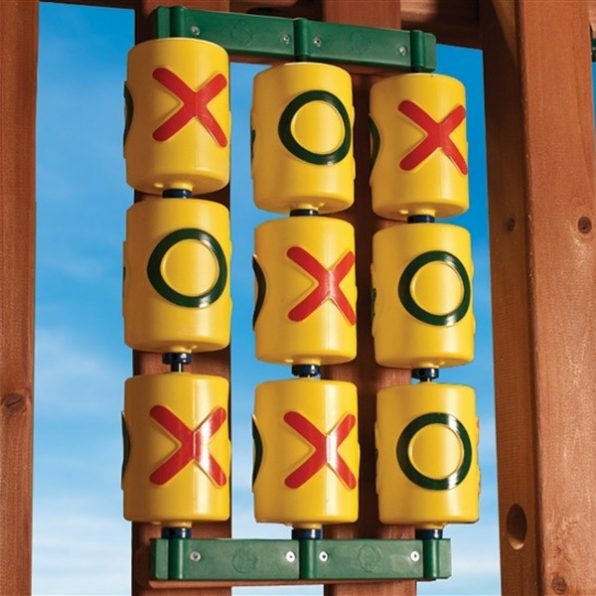 Your kids will find hours of fun bouncing between the two on the clatter bridge that connects the clubhouses. 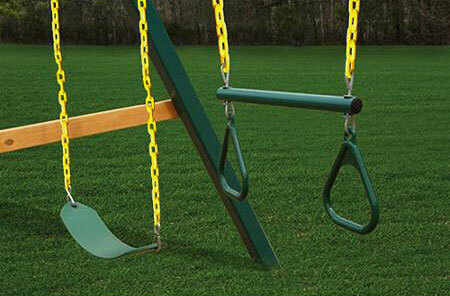 Nearly every swing set by Gorilla comes with two belt swings and a trapeze bar. The Catalina Cedar Wooden Swing Set is no exception. Each belt swing has a weight limit of 225 lbs. with a recommended swinging capacity of 150 lbs. The weight limit on the trapeze bar is 125 lbs. The maximum swing beam load is 425 lbs., plenty for your children and their friends. Every clubhouse needs a super-secret escape route right? That’s why the Catalina comes with two. A spiral tube slide comes off of the main clubhouse and wave slide escapes from the secondary clubhouse. Just make sure your little one’s favorite stuffed animal doesn’t get forgotten in the tube slide! Your kids will find three “ports of entry” to the main clubhouse, each one more daring than the next. Toddlers might have the easiest time going up the standard ladder. 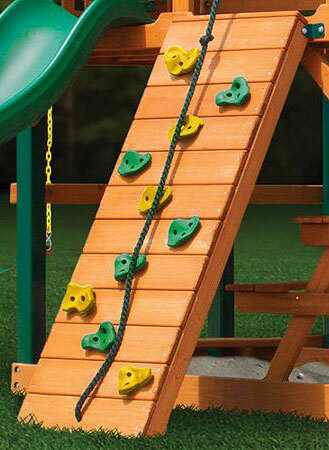 Your more adventurous child will be able to test his might on the challenging rope ladder. There is also a rock wall with a knotted rope to help little climbers. Every kid loves climbing a rock wall. The main clubhouse of the Catalina has a built in picnic table on the ground level. Your children won’t have to stop the fun at lunch time when they can eat in the cool shade of their clubhouse. A telescope to keep your little explorers on the lookout for treasure or pirates. Little drivers will keep their vessel on course with the Steering Wheel. Two flags add that little extra flare to the swing set. The lower level of the secondary clubhouse can also be used as sandbox. Think of the sand castles! How big is the Catalina? The Catalina swing set is twenty and a half feet long and fifteen feet wide. It is eleven feet tall at the clubhouse with the deck height being five feet tall. The swing beam is seven feet off the ground. It is recommended that a six foot safety zone be placed around the swing set. This means all structures (house, fence, shed, garage, trees, etc.) and overhead obstructions (tree branches, laundry lines, electrical wire) be no less than six feet from the swing set. Whatever surfacing material you choose to use (mulch, wood chips, fine sand, fine gravel, or shredded tires) should extend to the six foot safety zone. Can I put the Catalina Swing Set together myself? 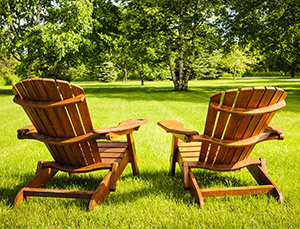 Depending on your ability the swing set can be assembled by two or more adults in 16-20 hours. You will need a few tools such as a drill, drill bits, wrench and sockets, level, tape measure, and hammer. Assembly will go much more smoothly if you inventory the parts and read through the instructions first. The instruction manual includes drawings of each part so they are easy to identify. Each board is also marked on the end with a tag to help identify which part it is. Make sure you choose an area with level ground before you start assembling. 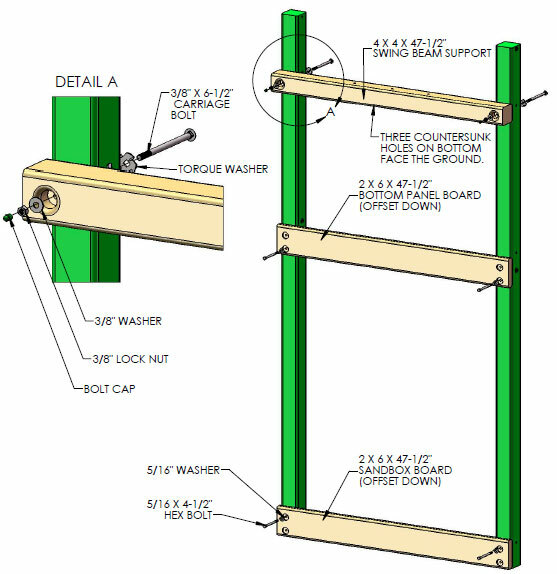 While you are assembling it is important to check that the structure is level vertically and horizontally. If the clubhouse is not level you will need to dig into the ground to level it. Is a copy of the instruction manual included? All Gorilla playsets come with instruction manuals. 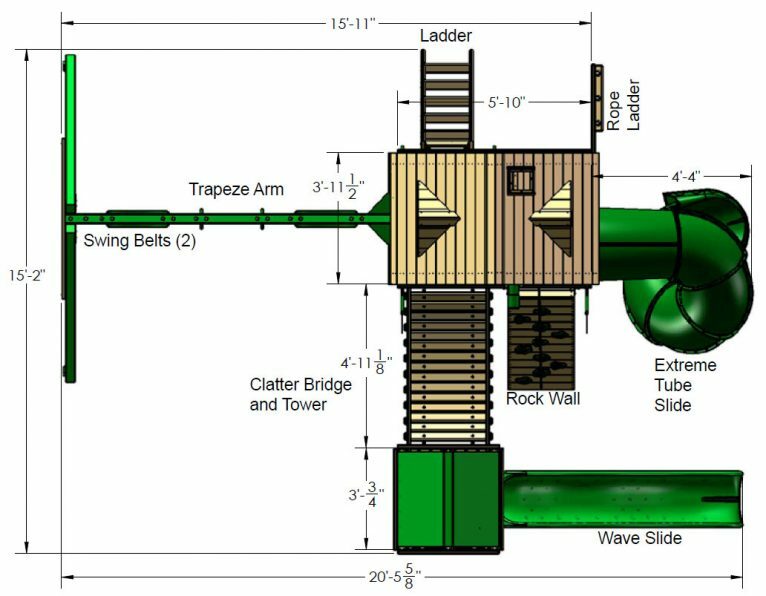 The Catalina Swing Set manual, like all other Gorilla manuals, comes fully illustrated with color drawings of each part and every step of the assembly. The color illustrations make the instructions easy to follow. What do I need to do to keep the swing set like new? Within sixty days of assembling your swing set be sure to check and tighten if needed all hex bolts/t-nuts, carriage bolts/lock-nuts, and lag screws. Do this again at the end and beginning of each play season. Within ninety days of ownership it is important to apply a sealer or stain with sealer to the wood. Gorilla sells a sealer and it is available on their website. If you live in an area that regularly receives snow be sure to remove your fabric canopy (over the clubhouse) to prevent sagging or stretching (and potentially tearing) of the material. Store the canopy inside and replace in the spring. The swing belts and other flexible features should be removed during seasons that experience extreme cold. These should also be store inside and will extend the life of these items. If the swings squeak they can be sprayed with a vegetable-based oil such as olive oil. Do not use petroleum-based oils such as motor oil. If you are worried about or have a wasp or yellow jacket problem you can prevent them from nesting by rubbing liquid dish soap on the underside of the interior wooden corners. If the slide is not fast enough for your kids you can speed it up by rubbing wax paper down the center every two to three weeks. Is the Catalina Cedar Wooden Swing Set for me? If you are looking for a swing set that has all the combined features of every other swing set this is the swing set for you. There are so many things to do on this swing set your kids will never get bored. Redwood vs Cedar – Which “Wood” You Choose? 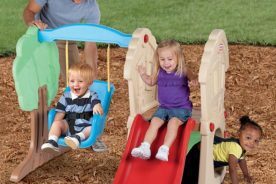 The Backyard Discovery Sonora, Is it the right little swing set for you?